Mix all ingredients well. serve cold. 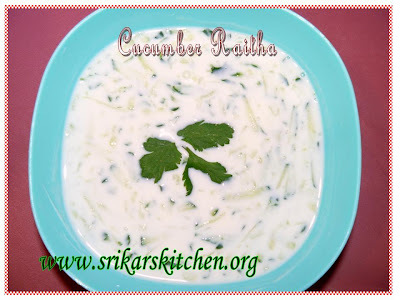 i make this raita whenever i buy cucumber..it gives cooling effect and tastes gud.. I love yoghurt with cucumber and if you add some garlic in it as well you'll get some tzatziki. I shall try it with peppers as well. I made cucumber raitha last night - but I didn't put chillies in mine. Yours looks good! Mmmm, I love cucumber raita and whenever I see it, I instantly want to have some! Good side for any one pot meal. Very cool and refreshing Raitha. Congrats on your 100th post.MysorePak and Raita look great. cucumber raita looks yuuummmy. I great dish with chole poori :). Excellent side for rice dishes..good one sri..